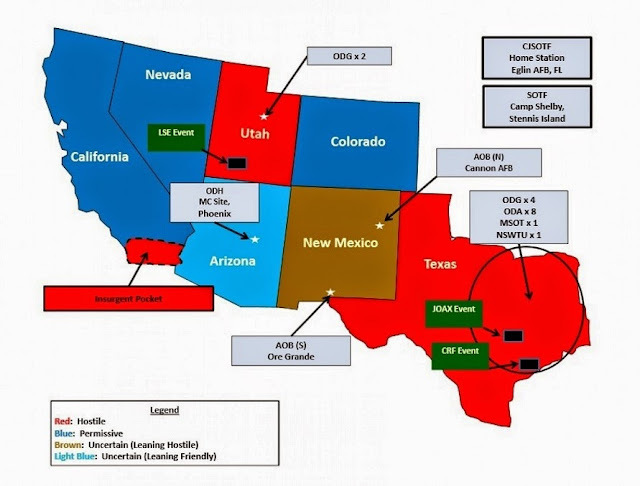 Unless you have been hiding in a cabin in the woods with no electricity and no internet access, you have heard about the the Right Wing freakout about the Jade Helm 15 military exercise where the four branches of the military will be practicing how to operate covertly in different environments, including among a hostile population, a “permissive” (non-hostile) population, a “leaning hostile” population and a “leaning friendly” population. A large percentage of Teabaggers and Republicans are losing their minds about this and, naturally enough, Texans (though hardly alone) are ground zero for the crazy. Texas Gov. Greg Abbott has ordered the Texas State Guard (Right Wing Watch got that part wrong … it wasn't the National Guard but the State guard ... a bunch of weekend warriors who like to play dress-up) to “monitor" Operation Jade Helm 15. Louis Gohmert predictably played the buffoon. And Rick Perry practiced his patented smarminess. The really funny thing is that not only has the military posted information on the web about the exercise, including the above map (not exactly SOP for a real military invasion) but the whole thing includes about 1,200 service members. In Texas, which has such major military bases as Fort Bliss, Fort Hood, Corpus Christi Naval Air Station, Randolph AFB and Lackland AFB, there are already some 109,000 active duty military personnel, and another 85,000 Reserves and National Guard, for a total of some 195,000 military personnel. So, anyway you slice it … if President Obama has full control if the military, he doesn't need Jade Helm to take over Texas; if he doesn't, the troops in Texas could sweep aside Jade Helm like a gnat. But, then again, rationality has never been a strong point of wingnuts. Thanks to the watching eyes of true patriots the federal guvment's plans will be thwarted and the takeover of the sovereign states will not be possible. Yeah, isn't it amazing that all those conspiracies never come true because of the watchfulness of those who circulate them?